I’ve done Merzig twice before, but it is a staple of the RTV league calender, so I was down to do it again in 2017. I haven’t been doing much training since Roth, and I have been eating lots and have gained weight, so I was worried before the race that I wouldn’t be on form. I had to get up at 5:30am and I had only slept about 4h, perfect preparation. Add to that that I had a puncture on Saturday, so walked home and hurt my foot by standing on a stone, I wasn’t feeling tip top! We were there at 8:30 and the weather was nice, we had a very strong team, Christoph, Michael, Heiko, Jonas and me. After being the best team in Zell and Worms, we were hoping to win again and make getting promoted a near certainty. So at 10:09 we went into the water. I hung back slightly so I could find some clear water to swim in. With absolutely no advance warning, the race started! I felt like I swam ok, not brilliantly, but decent enough. The Buoy was packed at the turn around, but after that I could get going on the 2nd half. I had hoped for about 12minutes, but got out and saw 12:45 on the clock. 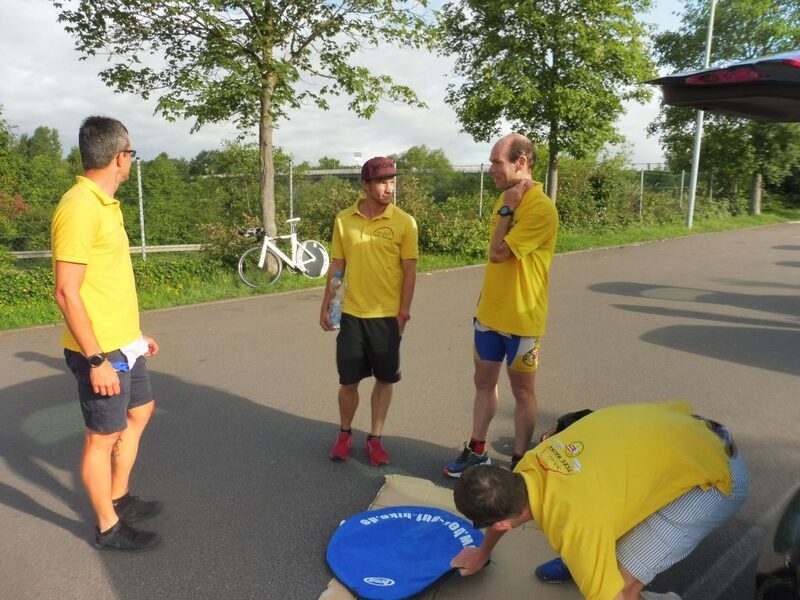 There is a bit of a run from the swim to the bike, team captain Sebi told me that I was 20 seconds behind Christoph and 30 seconds behind Michael. I got going on the bike and didn’t feel so great, but my pace was good. There was a group maybe 100m ahead of me, so I pushed to catch them. After 3-4km I caught the group, or should I say peleton. They were riding in a group and after Worms I didn’t want to get involved in that. A couple of guys gave it a good go at blocking me by accelerating as I was passing, but I made it past. I got to the front of the group and wanted to push on, but soon enough the group swallowed me up and I was left in the middle. I decided to hang off the back, as we had a near 41km/h average speed, so I couldn’t speed up to get away on a flat course, so I would just hang and hope that they get busted. We caught Christoph after maybe 12km and he had the same problem as I had had. We ended up just rolling around near the group, it sucked. In Worms I averaged 310w or so, here I averaged 255w. 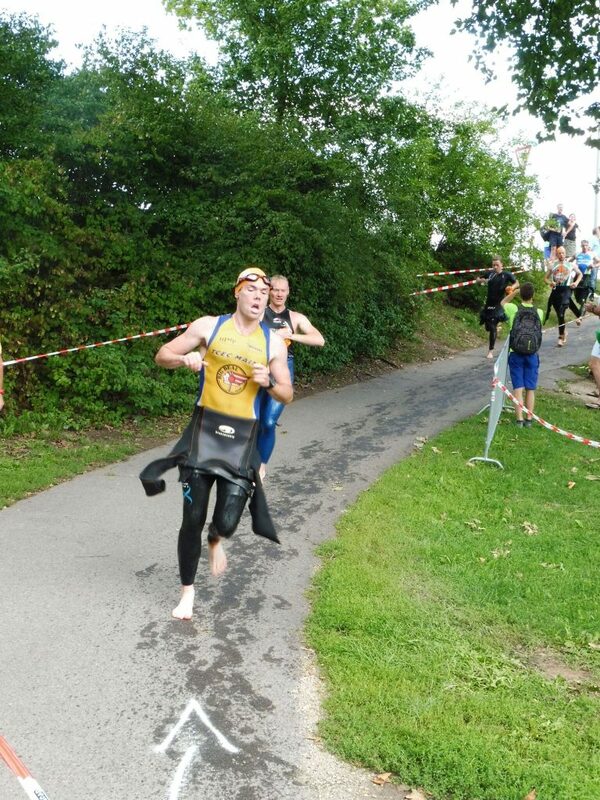 In T2 I messed up putting my shoes on again, so Christoph was 15 seconds clear of me. Apparantly Michael was 40 seconds clear, that would be tough! I passed Christoph after about 500m but wasn’t feeling too hot. I was passing plenty of people, but my legs felt flat. By the 2nd round it was getting a bit better, so I could at least roll for a few km. I could see Michael in the distance at the turn around, but I wasn’t catching him. I kept my pace up, but it wasn’t so impressive. 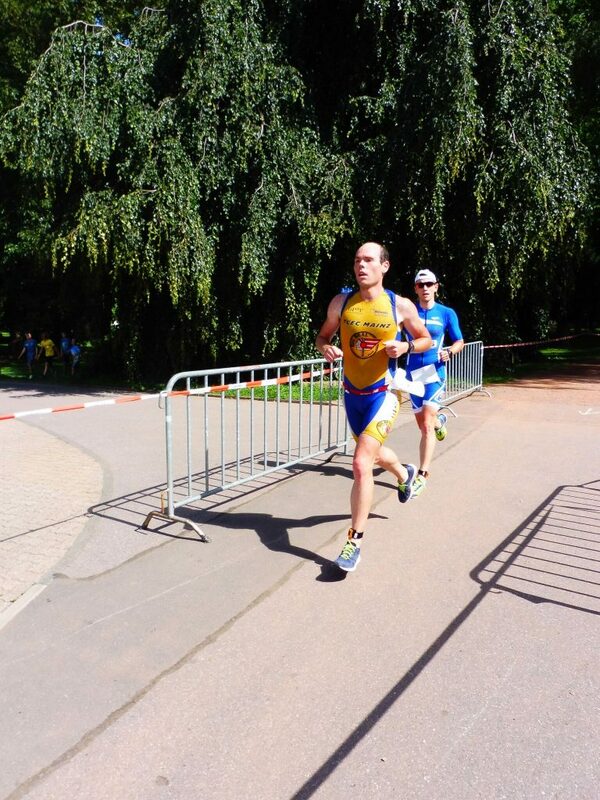 On the last lap of the 4, with only about 400m to run I could hear someone behind me. 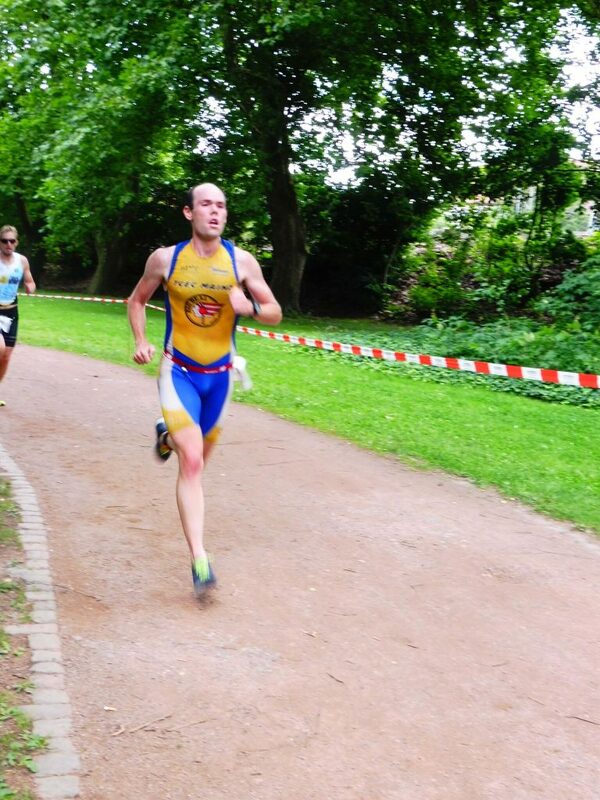 A quick look back showed me that it was someone from Tri Post Trier, so someone from my league, this was for position! 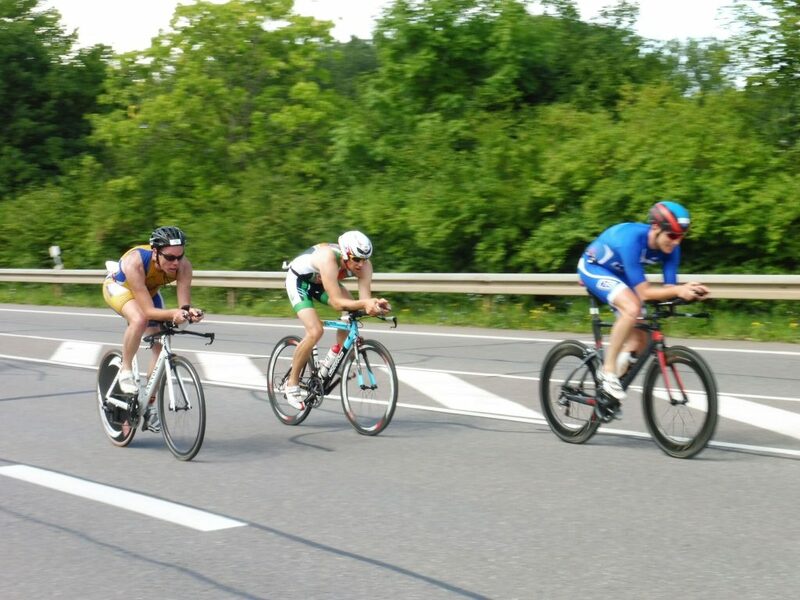 It felt like a bit of a nightmare race, my swim was average, bike limited by the group and run below par. I was 3rd from the 5 in TCEC. When the results were posted though, it turned out that I was 5th in the league in 1:04:06, so more than 6 mins faster than in 2015 (I think the bike was shorter and faster this year). I only lost to Michael by my bad transitions and ran the exact same time as he did. Actually it was a decent performance. More importantly, with 3rd, 4th, 5th, 12th (and 19th) for Michael, Jonas, Me, Christoph and Heiko, we were easily the best team, in fact it would have been near impossible for us to lose with those results! So we have won every race this season clearly, and just need to stay competitive in Pirmasens and Remagen to win the league. For me, I need to get back into training. It doesn’t need to be crazy training, but more swimming and running would be good, and maybe ease up on the eating too! It’s been 3 weeks since Roth, I have been sensible and taken some down time to recover, but now that time is over!